Melbourne Airport is a marvellous location to see, with a good little list of hotels. There are 9 located less than 5 kilometres from the middle of town. Try to take a look at the PARKROYAL Melbourne Airport and Holiday Inn Melbourne Airport. All these places are close to the main areas. Located only 4 kilometres from the city's heart is the local suburb of Keilor. If you want to find a place here, you better get on it, as the only available option is Keilor Motor Inn. For more options, try out the AKOM Docklands and the Crown Towers. They are located 18 kilometres and 20 kilometres respectively from the center. Others include the Park Hyatt Melbourne, 19 kilometres away, and the Grand Hyatt Melbourne, 19 kilometres. Once you've gotten a handle on Melbourne Airport, why don't you tour a little further afield? The Victoria district has many other things to offer tourists. Take a gander at the history museums, art galleries and open-air museums. Visitors should also admire the region's rivers and mountains. More active travellers can try snowboarding, skiing and mountain climbing. If you'd like to explore some close by cities, think about Melbourne and Gisborne. Head 19 kilometres to the southeast of Melbourne Airport and you'll find Melbourne. Alternatively, Gisborne is 30 kilometres to the northwest. Melbourne accommodations include the Docklands Private Collection of Apartments - NewQuay and The Westin Melbourne. The Gisborne Motel and Gisborne Peak Winery Eco-cottages are some of the choices in Gisborne. Crazy about sport? Indulge in your obsession by visiting State Netball Hockey Centre, which is located to the southeast of Melbourne Airport. Planning to stay nearby? The Langham, Melbourne and the Docklands Executive Apartments could both be just what you're looking for. 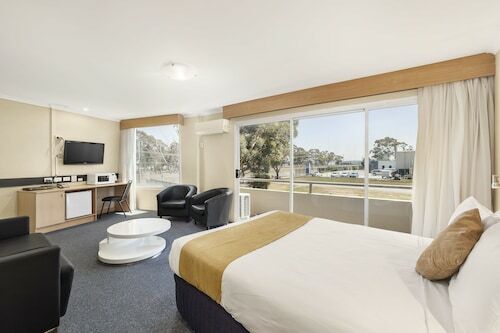 How Much is a Hotel Room in Melbourne Airport? 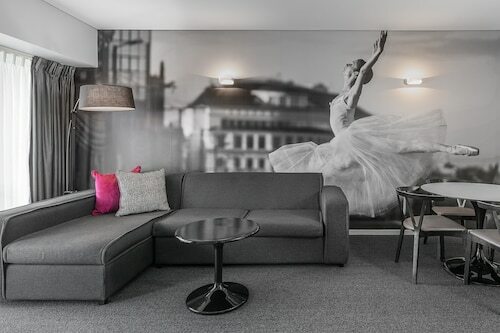 Hotels in Melbourne Airport start at AU$117 per night. Prices and availability subject to change. Additional terms may apply.